Pours a very cloudy dark copper with a bright white head. Nice puffy white head but it seems to be diminishing quickly. 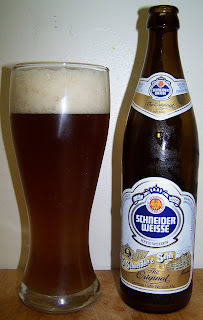 Nice aromas of sweet German malts, clove, and just a touch of flowering hops. Wow, that has more flavors than I expected. Let me try to dissect this a little. Malt sweetness up front, then a nice carbonation over the tongue then the real malt flavors hit you and before it’s over there is a nice low hop drying effect but the final taste that you are left with is a very pleasant almost caramel malt taste with spice and cloves. That’s a lot of experiences for one mouthful. There are some nice flavors I this beer. Interesting malt flavors notes of spice and clove, just a very nice tasting beer. And it sill maintains a very refreshing character even with all that going on. I’ve had several Hefeweizens before but none of them had this much flavor. Before this I thought Hefeweizens with dull chalky and not very flavorful. Boy was I wrong. If this is the original what happened to Hefes. Well at 63 degrees this beer still has a lot to give. It has lost most of it’s carbonation but the flavors are still impressive with no bitter harshness that some beers get when they warm up. Well I guess that’s a rap. This is an outstanding beer A+. This is now my new gold standard for Hefeweizens.